Continuing with Techmod's sheets on the Finnish AF, this set covers the time period from 1944-1945. During this time, the background white was replaced by a grey (Blue-Grey FS*5414 similar to RLM65) so that the insignia was not quite so visible at a distance. 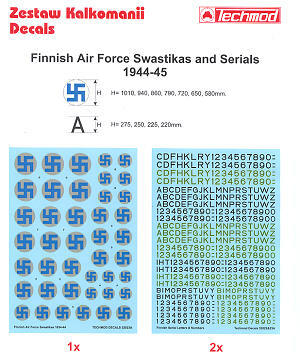 You get one sheet of grey background insignia and two identical sheets of serials numbers. These latter items are in two slightly different shades; one black, and one olive green. There are seven different sizes of insignia and four different heights of serials. This will allow the modeler to do just about any aircraft you can think of. Included is an instruction sheet that shows the standard placement of these markings. The Finnish AF was quite specific on placement so you can use this guide with confidence. 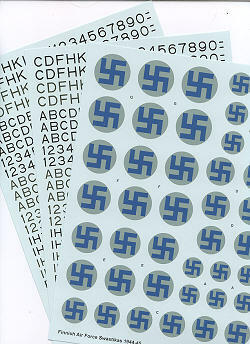 The decals themselves are superbly printed and quite thin, making for a logical choice for your next project.